Mad Max came in as a stray living on the street. Max is 4-5yrs old. Loves to show affection with rubbing against you and enjoys have tummy rubbed to a degree, like most kitties on his terms. He has been vaccinated, negative when tested for FIV/FeLV and has been given preventive. When he went in for neuter they accidentally mixed him up with another and unfortunately tipped his ear. :( Mad Max might need time to adjust to another cat in house until better adjusted. 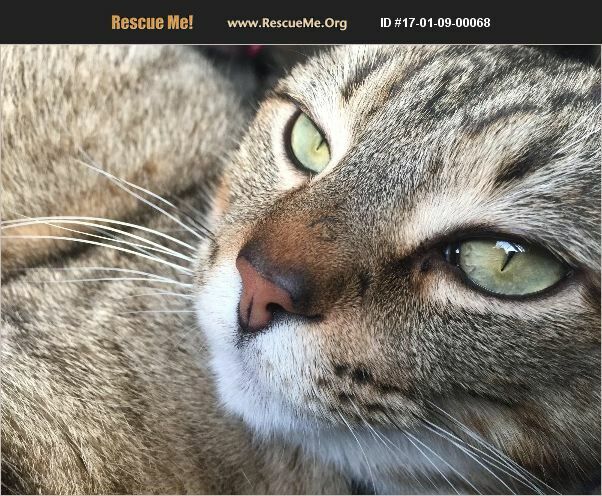 Since neuter he has become more submissive with lower temperament as with all males after neutering, extremely affectionate. Please consider adopting Mad Max. No, he's not mad and we call him Max in general. Please contact me via email beside my name for adoption application. He is microchipped. We have rescued many of his offspring while trying to apprehend him. He is gorgeous and loves attention. I have several great photos of this handsome Max. Please email me for more photos. An application will be sent, provide a # so I can contact you and tell you more about Max.